Checkout www.stormguard.co.uk who supply a range of draught proofing products. There are several things you can do to help reduce draughts on exterior doors. Most external doors are inward opening. Fit a brush draught strip on the bottom simply cut to size with a junior hacksaw. Then screw it to the bottom inside of the door. Position the brush so that it covers the gap between the bottom of the door and the door frame. As near to the ground as possible is best. Ideally it should be just touching the floor with the door shut. NB your floor may not be level. Make sure the door will still open properly with the draught strip screwed in the position you have chosen. Fitting a letter box cover and a key hole cover will also help reduce draughts. Again these simply screw in position over the letter box opening on the inside. For the outside of the door you can fit several products around the door frame. 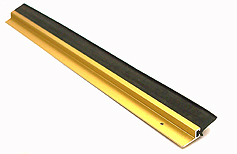 Either a bristle strip which will keep out draughts or a special rubber strip which keeps out draughts and rain. They come in kits enough to go round one door. You need to trim them to size with a junior hacksaw then screw or nail them in place depending on the fittings which will come supplied. The are usually predrilled to make this easier. Both types are very easy to fit. With the door closed offer up the strip to the door frame having cut it to size. make sure it's a snug fit then attach it to the frame.